The National Aeronautics and Space Administration (NASA) has created a high-definition map of Mars’ gravity, which provides a “revealing glimpse” into the mysterious but interesting interior of the Red Planet. It will be useful for future missions since the space agency is planning to send humans to Mars by 2030. 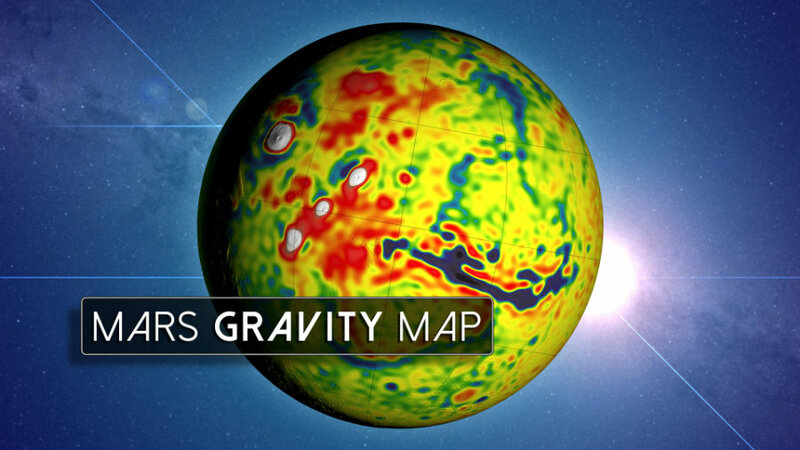 Gravity maps are great for looking at planets, which is fundamental to achieve future Mars exploration. If we are capable of understanding gravity anomalies of the Red Planet, we could give helpful information to controllers, to insert spacecrafts into its orbit, explains Antonio Genova of the Massachusetts Institute of Technology (MIT). Mars is recognized for its mysterious formation of specific regions. As a response, the new gravity map will help researchers to get a better knowledge about all those areas, added Mr. Genova, first author of the paper published in the journal Icarus, and researcher at NASA. After looking at the gravity map, researchers have proposed new theories about how some features have developed across the border that divides Mars’ northern lowlands, from heavily cratered southern highlands, said NASA in a statement published Monday. Moreover, by analyzing the gravitational relationship between the sun and the two moons of Mars, the team could confirm that the Red Planet has a liquid outer core of molten rock. The map is also capable of showing how Mars’ gravity has changed over the years. One complete cycle of Mars’ solar activity lasts 11 years, by observing how gravity changed throughout that period of time, researchers were able to calculate the amount of carbon dioxide that freezes out of the atmosphere “onto a Martian polar ice cap”, when it’s winter time in the Red Planet. “With this new map, we’ve been able to see gravity anomalies as small as 62 miles across, and we’ve determined the crustal thickness of Mars with a resolution of around 75 miles. The better resolution of the new map helps interpret how the crust of the planet changed over Mars’ history in many regions.” Said Genova. Creating such a complex high resolution map was possible by using data collected by NASA’s Deep Space Network, which is composed by three spacecrafts that are currently in orbit around the Red Planet: Mars Global Surveyor, Mars Odyssey, and Mars Reconnaissance Orbiter. It appears that gravity anomalies from Mars have been changing the trajectory of those spacecrafts orbiting the planet, interfering the signal that is sent to the Deep Space Network. As a response, NASA has collected data about those “fluctuations”, in order to built the map, which uses information collected in almost 16 years. NASA is committed to send humans to the Red Planet. But first, the space agency will launch several robotic missions to obtain more information about how the planet works. Currently, there are some spacecrafts and rovers in the planet, such as Opportunity and Curiosity. Early March, the space agency announced that InSight mission to Mars will begin on May 5, 2016. It will investigate the deep interior of the red rocky planet, which can provide information about Mars’ formation and evolution. NASA is also developing the Mars 2020 rover, which will cost approximately $1.9 billion. It will be equipped with several science instruments and complex technology, capable of obtaining complex data about the planet. “The quest to understand the interior of Mars has been a longstanding goal of planetary scientists for decades. We’re excited to be back on the path for a launch, now in 2018,” said John Grunsfeld, associate administrator for NASA’s Science Mission Directorate in Washington, in a press release. The new HD gravity map will be highly useful to determine how all these landers and rovers will be put into Mars. If we keep sending machines to the Red Planet, we might be able to send humans to its mysterious surface by 2030.